I decided I would use it in a small runner. Mixed in with the prints were co-ordinating solids. Solids have never been my choice to work with (I know, never say "Never".. I actually have a solids project on my "Want to Make" list right now!!) but I do know I don't care for them mixed in with prints, co-ordinates or not! So I plucked those out and saved them for piecing the back. 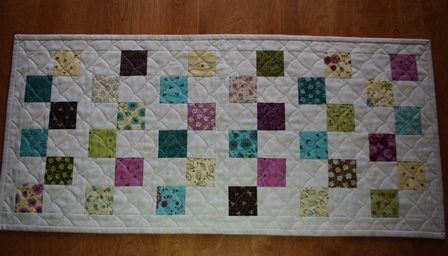 As you can see, this is a very simple and quick runner to make up (great for a quick gift!) The pattern is from Connie Kresin Campbell's blog, Free Motion by the River which you can find here. She calls it the 6 Square Runner. Thanks Connie, for the great pattern! strips with the solid mini charms, I made it work. Because I pulled the solid squares, mine is a bit shorter than hers; Connie used all 42 mini charms on the front, I used just 36, so I have 6 "rows" whereas hers has 7. Both work! My runner's finished size is 14" x 31". 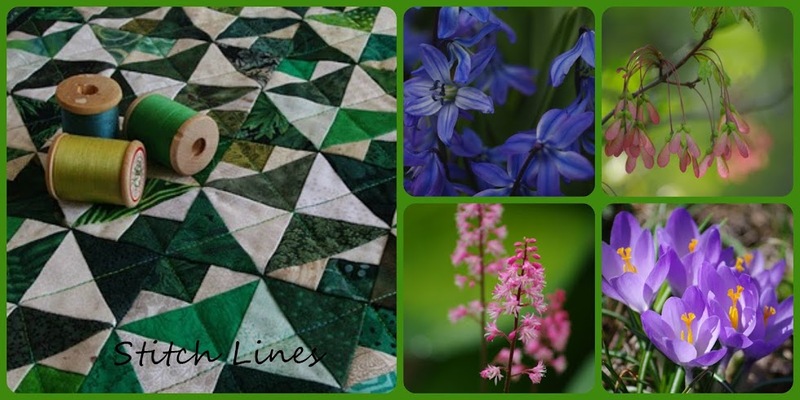 I quilted it with an overall clamshell design with my walking foot in a matching soft beige Aurifil thread, and although I had purchased yardage of one of the dark greens to use for the binding, I really liked the background fabric better so ended up using it. 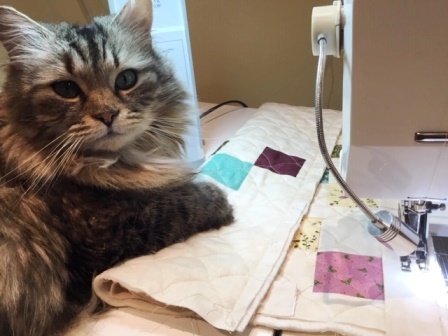 As you can see, I have a "supervisor" making sure I get that binding sewn on just so. Scamp loves to see what I'm working on... you know the saying about curiosity and the cat! 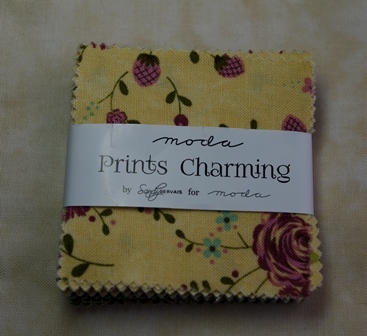 Of course you could use a regular charm pack of 5" squares for this too, just slice each one into four 2.5" squares. I can see myself making another of these, probably with Christmas prints. I have part of a Christmas charm pack left from another project. I'll have to count the remaining squares to see if there would be enough. If not I'll just mix in a few other reds and greens... you wouldn't tell, would you? I am linking to Wendy's Peacock Party here. Stop by to see what everyone has been working on this week. Easter is coming...is everybunny at your house ready? Fabriholic: n: One who can't control the urge to buy fabric they don't have a project for. Again. Very nice and, yes, I have charm paks that I have no idea what to do with. 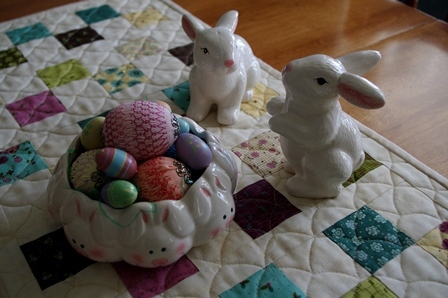 My daughter-in-law is hosting our Easter dinner this year so everything will be ready. 😊 How about you? A wonderful week to you! Hi Grandma Linda, I just read your last 6 posts. Very sweet grandchildren and a clever grandma to stitch them such great things. Love all your projects and you are definitely skilled with a walking foot. I’m envious! Thanks for visiting me today too. Happy Stitching! It’s a very cheerful runner! I find pieces that have that scrappy look so appealing. Well done! You have very cute quilt inspector! What a sweet project. How nice that you have a something to use for spring decorating. 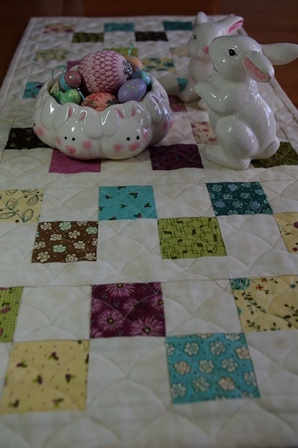 Even more, I think it's fabulous that you quilt your own projects. I'm a huge proponent of a completely self-made project. Great work! Yes I do have a couple of charm and mini charm packs that I have not done anything with, so this might be a good table runner to make too. I also follow Connie. I love your runner and the quilting is great too! 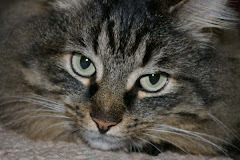 Another blog friend calls her cat the "snoopavisor", lol! You have a pretty cat. Reminds me of a cat my mom had, actually there were 2 cats that were sisters and I named the one with the pink nose Cupcake and the brown nose Muffin. Your cat looks like Muffin. They were both long haired cats. Thanks for stopping by my blog and leaving me a comment on my bag I linked on Wendy's Peacock Party. 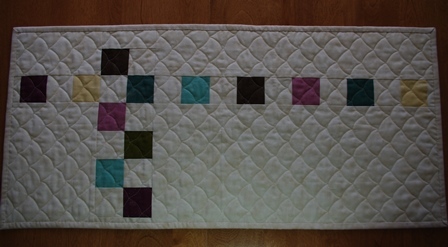 Hi Linda, I like the table runner, it's a sweet,simple design. And your feline supervisor is great! Thanks for visiting my blog, hope to see you again at future Peacock Parties. Very pretty runner - it says "spring"! I cannot imagine quilting clamshells with a walking foot - what a patient woman you are! I have some of those same bunnies. Polly knocked one over last week and his ears broke off...but they are back in place now, and you'd never know it happened. (thank you, Crazy Glue). Hi Linda, your table runner is absolutely beautiful! Little Scamp seems to love it. Thanks so much for sharing it with me! May 25, Local open class. 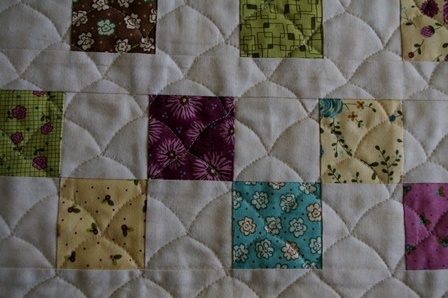 Quilting with the Walking Foot. FULL. All rights reserved. Please respect copyright and do not copy, "pin", reprint, repost or use in any way, ANY of my photos or writing without asking me for permission. I'll likely say Yes, but please have the courtesy to ask first. Thanks for your understanding! The Color of Our Sky. 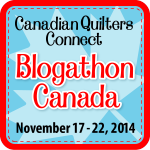 You're Invited to the 3rd Annual Grow Your Blog Event!